- Amy Michael-Carmichael, American Missionary to Japan, 1895. Every summer, Aomori City’s Nebuta Festival brings in flocks of tourists from all over to gaze and wonder at the festival’s huge illuminated floats. Nebuta’s giant floats are the stuff of fantasy and nightmare depicting historical and legendary characters some of whom were of demonic origins. Visages of snarling faces of humans, animals, monsters, and demons of enormous proportions locked in grisly combat assail the eyes of visitors in a seemingly pagan-like splendor. If a 19th century Christian missionary had ever witnessed the Nebuta Matsuri, they would have probably thought that they had stumbled upon the heart of darkest heathendom. But Nebuta is not about worshipping the forces of darkness or warding away evil spirits. 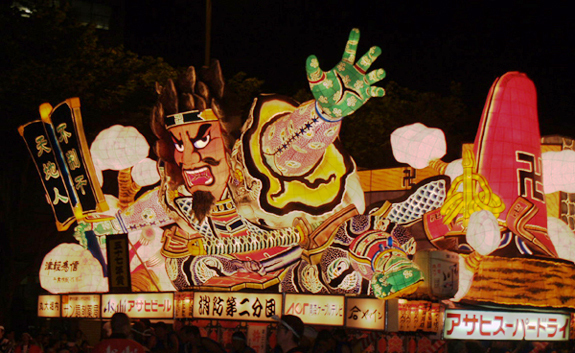 The festival is yet another creative and elaborate way for Japanese to ward away the sleepiness brought on by the summer’s heat through massive quantities of alcohol and gigantically terrifying floats. Aomori City is the capital of Aomori Prefecture. It is a port city which was founded in the early part of the Edo Period (1603-1867) by the second lord of the Tsugaru clan. The city’s history had been rather quiet over the centuries until WWII when the Americans bombed it practically flat. Aomori rebuilt itself and in recent years discovered buried in its outskirts an ancient city inhabited over 7,000 years ago. While the city has had a relatively uneventful existence – save for WWII bombings and one earlier fire – it hosts one of the most spectacular and unique festivals in all of Japan: the Nebuta Matsuri. The Romance of the Three Kingdoms is a popular re-occurring theme at Nebuta. The Three Kingdoms is ancient Chinese story based on historical events of the 2nd and 3rd Centuries when the Han Empire collapsed. China fell into three separate kingdoms that warred continuously with one another. Lui Bei is one of the prinicipal heroes of the Romance. He and his two brothers fought to restore the Han Dynasty but were unsuccessful. Instead they established the short-lived Shu-Han Dynasty, one of the three kingdoms in the Romance. Zhang Fei was not Lui Bei’s brother through blood but through the swearing of an oath of loyalty. He was great general but sometimes given over to strong drink which affected his judgment at times. The origin of the festival is one that invites debate among those who care to debate such things rather than spending their time simply gawking at the enormous floats and dancing the nebuta odori dance in an inebriated haze. One theory is that the festival goes far, far back long when much of Tohoku represented a kind of Wild West frontier of hardy settlers and indignant natives. In the 8th Century Shogun Sakanoue no Tamuramaro,* led an expedition into the northern regions of Tohoku to subdue the indigenous Emishi inhabitants and increase the territory of imperial Japan. 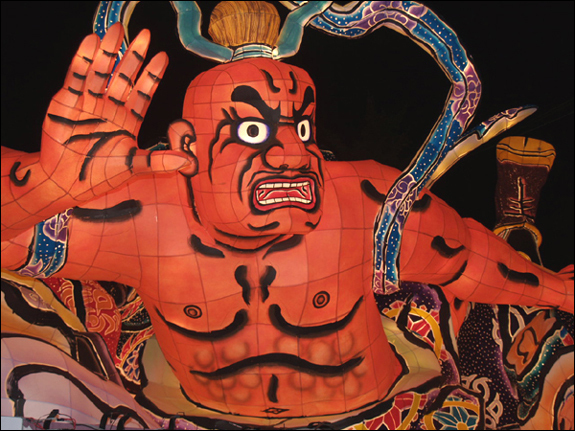 According to legend – but not fact – Tamuramaro built nebuta floats to lure the Emishi into an ambush. Legend states that this occurred in the area that is now Aomori City but in reality Tamuramaro’s campaign only reached as far as modern day Iwate Prefecture. The Outlaws of the Marsh or Suikoden in Japanese is another Chinese classic (Shuihu Zhuan in Chinese) that has received widespread popularity in Japan. Suikoden is a story based on historical outlaws during the Song Dynasty of the 12th Century who resisted corrupt government leaders. The story was set down officially in writing in the 14th century by Shi Nai-an. The story was later translated and adapted into Japanese in the early 19th Century. It became a huge sensation. The story was particularly popular with the lower class who admired the heroes of Suikoden for their defiance of the authorities. Tattoo art based on Suikoden became immensely popular as well. 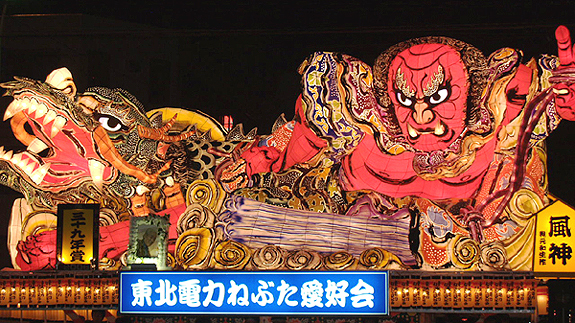 Another theory is that Nebuta is an adaptation of the Chinese Tanabata festival. Tanabata comes from an ancient Chinese legend about two starred-crossed lovers forever destined to be apart save for a brief time every summer. The custom was to set a toro – a candle placed on a wooden plate covered with Japanese paper – adrift on the water. Nebuta’s floats grew in size and shape over time till they became the unique hulking structures they are today. The third theory is a bit more mundane. 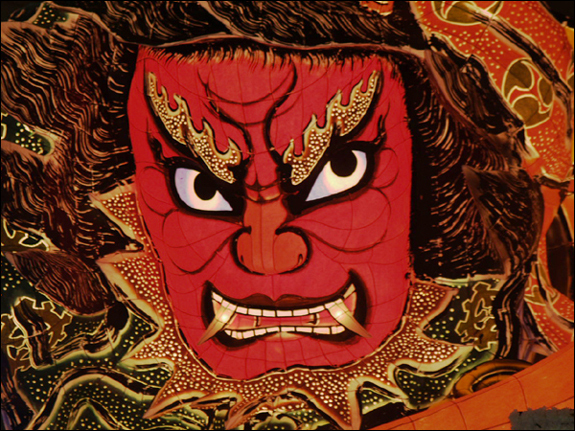 Nebuta was believed to have come about as a way of warding off the drowsiness that comes with the summer heat. Some servants of the Tsugura lord began walking about in the summer evenings with lanterns. Others began to copy their habit. 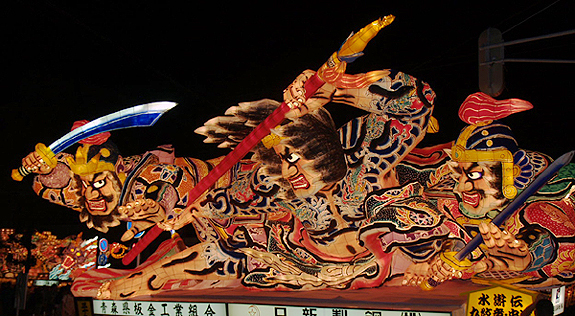 The word “nebuta” is thought to have been derived from the world “Nenpute” which means sleepy in the local dialect. The giant decorative floats of today grew out of those lanterns used during the early beginnings of the festival. 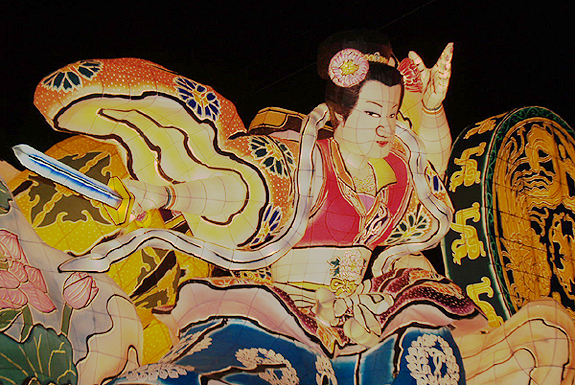 The making of the Nebuta floats is a community project. Many people will labor to create new floats every year. The principle artwork and design is handled by professional Nebuta artist known as Nebuta-Shi. Some of them have been designing Nebuta floats for decades. 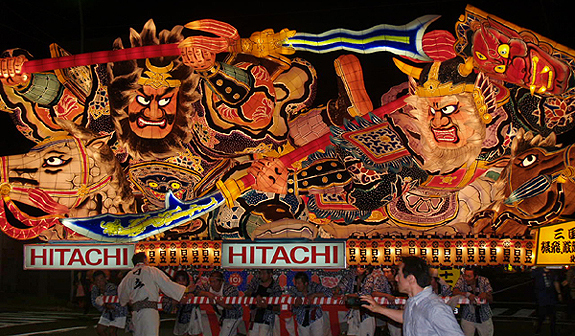 The floats are made of tough Japanese paper placed over a framework of wood and metal. The floats can be up to 9 meters wide, 5 meters high, and can weigh up to 4 tons. They take about three months to construct though the whole process from design to last-minute touches can stretch from the end of one festival to the beginning of the next years. The cost of some of these floats can run upwards to $200,000. Despite their ponderous weight and size, the Nebuta floats are not “floated” about by motorized vehicles. Good old fashion manual labor is employed to push and pull these massive floats through the city’s streets for nearly two hours. The float handlers will occasionally rush at the crowd as though they planned to ram them. Seemingly at the last moment the reckless advance is halted to the relief of those in the front. The handlers will then show off their skills by twirling their huge burden around. After the parade, the handlers celebrate their release from festive drudgery by feasting and drinking – lots of drinking. In the past the Nebuta Matsuri was a wilder affair attracting a rough crowd looking to drink and fight. Men of various districts of Aomori City and Prefecture would gang together and get into fights with other groups. All of them would wear black clothing generally of traditional wear. They were dubbed the Karasu Hanto – crow dancers. When travel to Aomori became more available to the rest of Japan, the number of tourists to Nebuta grew as did fears that the Karasu Hanto would be detrimental to tourism. Nowadays, the police are out in force to keep a tight rein on things. For adventurous types this may take some of the fun out of it. The Nebuta Matsuri runs through the first week of August for a nearly a full week. At the end of the festival, all the large floats are taken out to bay and “floated” along like their tiny cousin, the toro lantern. However, the Nebuta Floats are not allowed to simply drift off out to sea. They’re brought back and later either taken apart or sent around to other cities and countries for display. Those chosen as the best floats of the festival will reside in the Nebuta Matsuri Museum for the next few years before they eventually deteriorate. Don’t Just Watch – Join In! Visitors to Nebuta have the option of actually becoming a part of the festival procession if they wish. Fortunately, they won’t be made to push one of those massive floats but they can join in with the groups of dancers. Some dancing groups allow visitors to dance with them. Willing visitors need to rent or buy a Nebuta Odori costume in order to participate. 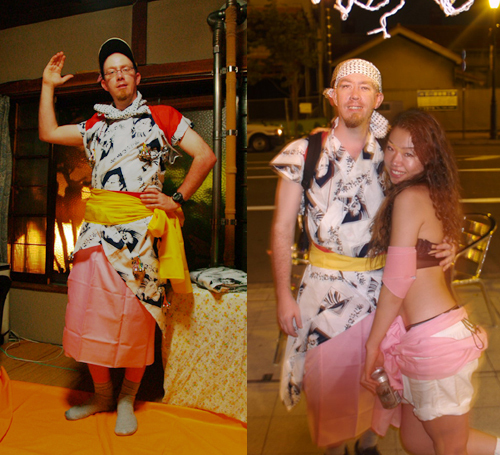 The Nebuta costume is not an easy thing to put on as I found out. I didn’t realize how bloody complicated it was to put on so the shop staff led me to a small ryokan (hotel) where someone would assist me. Before I knew it, I was down to only my boxers and socks in some strange woman’s living room. I was wondering if I was going to have to pay extra for this. As she was getting close to grandma years, I relaxed my concern and my beer gut. With the robe, I got an underskirt in a very masculine shade of pink, a yellow sash, a red bow tied on the back, a polka dot head band, and it also came with bells – oh, yes! I removed most of them shortly afterwards as they started to get really annoying very quickly. The end of Nebuta can bring a sad sigh to the citizens of Aomori with the promise of coming Winter – it sometimes snows as early as late September. And yet with each festival’s ending there lies the hope of another Nebuta Matsuri just as grand and magnificent as the last. *At this time the office of Shogun was temporary and was bestowed by the Emperor. Shogun means “Eastern-barbarian queller” referring to the original inhabitants of Northeastern Japan. From the late 12th Century to 1867, the office of shogun became a permant one which the emperor had little say in the matter.